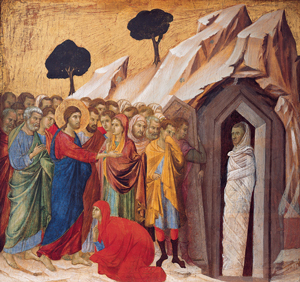 “Lord, if you had been here, my brother would not have died.” Both Martha and Mary, sisters of the dead Lazarus, say this to Jesus on meeting him. Indeed. It could never have happened if Jesus had been there! Our first response to another’s death is often, “I can’t believe it!”Neither can we believe that someone we have known and loved is completely and utterly gone. So we may console ourselves with their living on in their works, their children, or our memories. But this is not enough and is not what Christian resurrection means. It means we will live and gather again, in our own bodies, in a new and wonderful place. This is our faith. Father John M. Hamrogue, C.Ss.R.